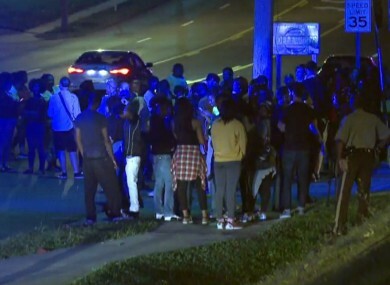 Crowd gathers near the scene where a police officer was shot. A FERGUSON POLICE officer was shot in the arm last night after encountering two men at a community centre who ran from him and then opened fire during a foot chase, authorities said. St. Louis County Police Chief Jon Belmar said at a media briefing early on Sunday that the officer approached the men around 9:10 p.m. because the community centre was closed. As the officer approached, the men ran away. When the officer gave chase, “one of the men turned and shot,” Belmar said. A search was underway for the suspects early Sunday in Ferguson, the St. Louis suburb that’s been the scene of racial unrest in the wake of the August shooting death of an unarmed black 18-year-old by a white police officer. Brown’s parents told AP on Saturday they were unmoved by the apology. Email “Ferguson, Missouri is dealing with another shooting - this time a police officer has been shot”. Feedback on “Ferguson, Missouri is dealing with another shooting - this time a police officer has been shot”.